Here at PCSpecialist, you can find a wide range of high performance Gaming laptops designed to fit your gaming needs. Whether you’re in the market for casual gaming while on the move or wish to have a full enthusiast desktop-replacement, PCSpecialist’s range of Gaming laptops will surely fit the bill. Our user-friendly configurator makes choosing your desired Gaming Laptop components a breeze. Each Gaming Laptop can be configured with a range of processors, graphics cards, multiple storage drives, a range of memory options and more! You can expect to find amazing technologies such as ultra-fast responsive 144Hz screens, customisable RGB keyboard illumination, macro functionality and more with our Gaming laptops. 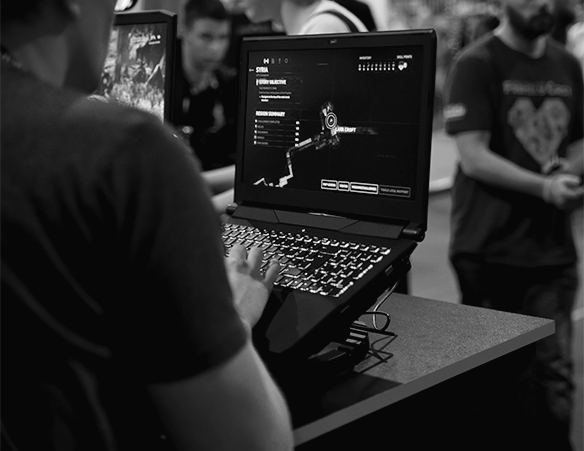 Step up your game and immerse yourself in the latest games – PCSpecialist’s Gaming laptops are perfect for the gamer on-the-go. Get a Gaming Laptop that’s more you! Take full control of your Gaming Laptop. Each system has software to enable you to personalise your Gaming Laptop to your requirements. Lighting, hotkeys and fan speed are just a few of the features you can customise. From €840 inc VAT and delivery. From €910 inc VAT and delivery. From €1,060 inc VAT and delivery. From €1,400 inc VAT and delivery. From €1,410 inc VAT and delivery. From €1,870 inc VAT and delivery. From €3,040 inc VAT and delivery. The processor (CPU) is one of the most important components within your Gaming Laptop. Select from a range of Intel processors and get the edge over your gaming opponents. Experience desktop graphics performance and stunning visuals with a selection of dedicated mobile NVIDIA 10-series graphics across each of our Gaming laptops. High quality memory in your Gaming Laptop results in smoother gameplay. At PCSpecialist you can choose from a range of Corsair memory (RAM) at multiple speeds to power your next custom-built Gaming Laptop. Build the Gaming Laptop of your dreams with our easy to use configurator. With a huge range of the industry’s latest and most powerful components, you can configure your next Gaming Laptop to suit your budget, gaming style and portability. 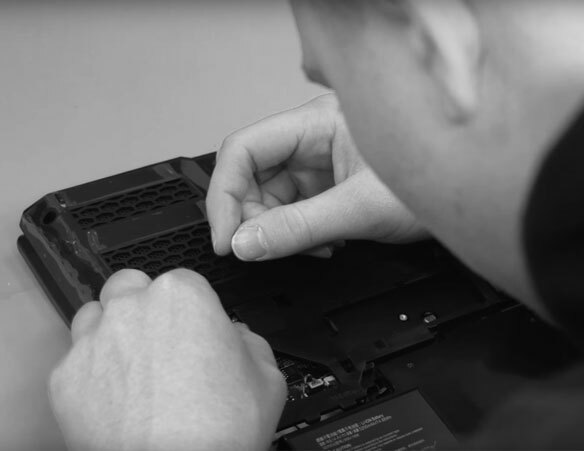 Each Gaming Laptop has been hand-built by our expert technicians and undergo a vigorous testing procedure to ensure that every Gaming Laptop has unrivalled performances in the latest games, straight out of the box. We are very confident that we have the industry’s best expert technicians. All our gaming laptops go under thorough testing to make sure our gaming laptops are ready to go upon delivery! This lowers our return rates and allows our customers to enjoy their gaming laptop! The majority of staff at PCSpecialist are also avid PC Gamers. Collectively, they have racked up countless hours playing time across all the latest gaming titles over the past 20 years. Rest assured you have enthusiasts building your new Gaming Laptop and we'll strive to deliver the ultimate gaming experience to your home. PCSpecialist Gaming laptops: built for gamers, by gamers. Gaming is many of our staff members’ passion, so when we are building your laptop, we always put ourselves in the gamers’ shoes and we put in the care to each build as if it was our own. We LOVE gaming! At PCSpecialist we build with passion—so rest assured you will be in good hands. Build Your Gaming Laptop Today! Have you ever wanted a gaming laptop but was daunted by the lack of customisation in the industry? Well look no further because here at PCSpecialist we allow you to spec up your own gaming laptop and then we will build and test it for you! We have a wide range of form factors to choose from, from portable gaming powerhouses to gaming enthusiast desktop-replacements. Here at PCSpecialist we want to make sure that every Gaming Laptop we sell is perfect for our customers. If you would like to know more information about our Gaming Laptop, feel free to give us a call! Our friendly call centre staff will be happy to help! Are you ready to configure your OWN Gaming Laptop? Let's start right now, choose all your components yourself and make your dream gaming laptop right here on our website! Build a portable, high performance Gaming Laptop right now! Gaming Laptops from PCSpecialist. Find your dream Gaming Laptops right here. Custom designed Gaming Laptops; built by gamers, for gamers! Get your perfect Gaming Laptop today!